Now that every Treasury auction is a potential landmine, with the backstop from the Fed gradually fading into the distance, traders are forced to start evaluating demand for US paper. 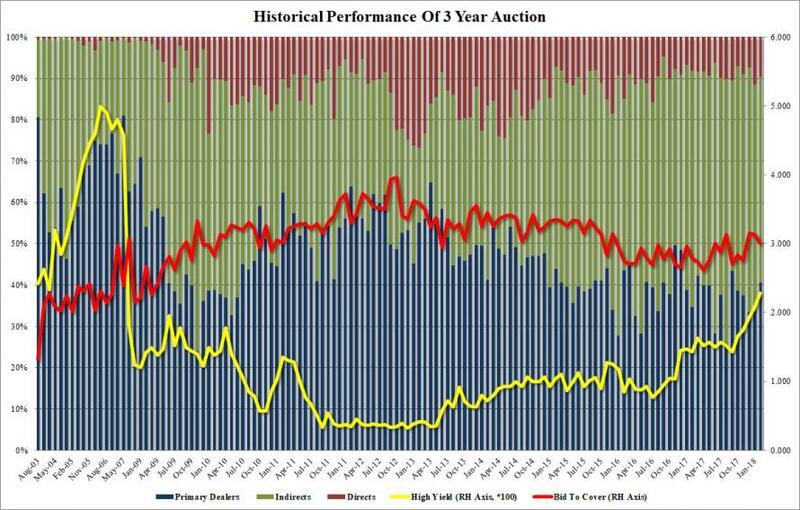 And, to help them along, we can safely say that today's 3Y auction was a far cry from the stellar demand for paper in mid-February. Here are the details: today's sale of $26 billion in 3Y paper printed with a high yield of 2.28%, a 0.2 bps tail to the 2.278% When Issued and the highest rate since May 2007. This was the first tale for a 3Y auction since November. The Bid to Cover likewise disappointed, declining from 3.13 in January to 3.00, the lowest since November, if modestly above the 6M moving average. The internals were also mediocre at best, with Indirects taking down only 49.8%, far below January's 54.9%, and the 3M average 55.3%. Directs took down 9.7%, also below the January 11.5% if in line with the 6 month average, leaving 40.5% to Dealers, well above the 33.6% in January and 35.4% 6 month average. Overall, a mediocre auction, and one which bond bulls will pray does not repeat during tomorrow's sale of 10Y paper, although it is safe to say that Monday's 14bps "volmageddon" rally may have been a major culprit for the decline in demand.